Henrik Fabri defends his Blitz Championship in style. – Isle of Man Chess Club. Isle of Man Chess Club. Kirk Braddan Church, Braddan Bridge, Peel Rd, Douglas. Douglas 2018 finishes in a 3-way tie. Rnd Five – December 5th – 7.30pm Clocks. Rnd Four – 21st November – 7.30pm Clocks. Rnd Three – 31st October – 7.30pm Clocks. Rnd Two – 10th October – 7.30pm Clocks. Rnd One – 3rd October – 7.30pm Clocks. Henrik Fabri defends his Blitz Championship in style. Street Fighting Chess. Henrik Fabri. The 2018 Blitz Championship had a healthy entry of 15 players with a slight change to the format. Two groups of 7 and 8 players played a round robin tournament with the winner of each group progressing to the final for a one match play off. 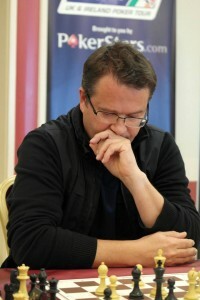 Henrik Fabri took group A with a maximum score of 6 out of 6. Silvester Sipos took group B with a score of 6 out 7. Henrik won the toss and proceeded to squeeze Silvester and eventually dominated the king side space – Silvester hit time trouble, simply that was the end. Posted on October 3, 2018 October 3, 2018 Author BrianCategories News 2016 - 17 Season. Previous Previous post: Baard Dahl Manx Champion 2018. Next Next post: Rnd One – 3rd October – 7.30pm Clocks.